That is the greatest thing ever. It’d be even better if it was just another level of The Dark Knight’s already ground breaking viral marketing. ah…. 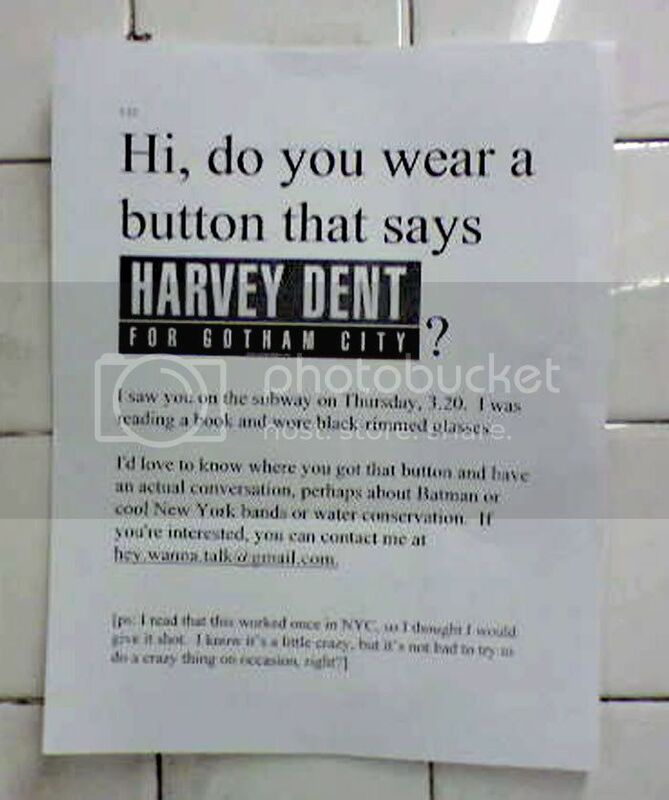 is the Harvey Dent button part of the flick’s viral campaign? Aw. I hope he finds his nerd lady. You know, that’s so funny—I assumed it was a nerd lady who wrote the note to a guy! Wow, maybe so. I prolly just read it that way cos I would totally wear that button, partly because it’s awesome and partly SHEERLY IN THE HOPES that someone would react in just this way. We all know that’s your sign! I’m thinking this is WB’s viral marketing for the Dark Knight. Note how it describes the writer “I was reading a book…” but not *also* the person wearing a button, which is usually how these “I saw you…” ads go. Yeah, I’m starting to think you’re right. Also, it doesn’t specify the train line or the time of the day. though i feel bad for the “dude,” i’m glad it wasn’t all some viral marketing campaign.